Cecilio is one of our favourite violin makers, as they are such a cherished company that produce great quality violins. Cecillo’s win affection from violinist all levels, with their handcrafted violins and high quality bows. Named after the patron saint of music and musicians, St Cecilia, experienced violinists can certainly make heavenly music with their violins. Although the top-rated violins can be expensive, teachers around the world rate Cecilio very highly and it will certainly be a sound investment. The Cecilio CVN-200 is a lower budget violin that delivers on durability and a surprisingly good quality for its low price tag. This violin is made from rosewood and is varnished to high shine finish, adding to the aesthetics of the violin. It does not just look good though, it is very sturdy and has everything that a newcomer/early grade player will need. This model is recommended by tutors across the world, as they consistently see how much students progress with a Cecilio and the price does not put too much stress on parents who pay for the violin. D’Addario Prelude strings are used for ultimate performance as is the addition of a boxwood tailpiece with 4 nickel plated fine tuners. These hidden extras take a budget level violin to something a lot more practical for those learning the intricacies of violin playing. The tone is not as warm as a more experienced violin players would want, but it will last a good couple of years, until an upgrade is affordable. This would easily see beginners reach grades 3/4 before you would begin to struggle with the most delicate tones required. The CVN-200 is an all round good beginner student violin, that will give children and parents a taste of what violins can offer and how they can be played to the best of their ability. The Cecilio CVN-300 is a beautifully constructed violin that will be treasured from the moment it is first used. The sound and tone of this model is unbeatable for the price paid, with surprisingly warm notes coming through, once the student passes through the grades. The violin will not allow for progression through higher grades, but will last a good 3-4 years when starting out. The violin is made up of a hand carved spruce top and maple back and sides, fitting are all made up of ebony and the bow that accompanies the violin is made of Brazil wood. You get a whole lot of accessories with your violin, including bow, case, chin rest, shoulder rest, rosin, 2 spare bridges, a tuner and extra sets of strings. There is also a CD/DVD tutorial, so that you can get started straightaway whilst you are looking for a tutor. With all that is included in this package, it is hard to say no and will take a lot of stress out of buying a violin, for parents with no experience. The model also comes in a left handed version, again at excellent value for money for the quality and care that is put into the instrument. This violin is a good choice for those who are on a budget, but who want a reasonable quality that will have medium quality sound. This model will not hurt the wallet too much and is so easy for children to adapt to, a good choice all round for ease of use, set up and durability. The CVN-500 is a premium quality violin that is a step up from the CNV-300 model, making it suited to more experienced players. Made from sold spruce to the top and maple to the side, neck and neck, with ebony fittings this violin should last for years. The tone from this violin is excellent, much better than the price tag would suggest. A high quality tailpiece with 4 nickel plated fine tuners allow for great flexibility and allows the player to put their own stamp on the music they play. The bow is made from brazilwood and high quality horsehairs, making it strong and sturdy. There is nothing worse than having a cheap bow that breaks every week, something that should not happen with this bow. The CVN-500 is a good intermediate violin that will take well to adjustments, once students achieve mid range grades and are looking to reach higher. With fine tuning and a replacement bridge from time to time, this violin may even take students up to grade 8 with ease. The outfit comes with a VNC-30C light weight form fitting hard case, quality rosin and an extra bridge. The next model up from the CVN-500, this Cecilio and offers a superior finish and quality. The body is made up of one piece of wood, a strong maple that has been aged for at least 7 years. We adore the ebony tailpiece with mother of pearl inlaid that gives this violin a classy look that is complimented even further by the hand rubbed finished. There are four gold plated fine tuners for extra precision and Cecilio uses the much loved D’Addario Prelude strings, for perfect tone and pitch. As with all Cecilio’s the fingerboards and pegs are made of ebony and the bridge comes fitted, for ease. This outfit comes with a chin rest, 2 brazil wood and horsehair bows, rosin and case, all of high quality and fitting for this wonderful violin. Fun and useful extras include a chromatic tuner, lesson book and a handy spare bridge. The praise that we are singing for this violin may give the impression that it is out of your price range, but it is extremely affordable for those wanting something a little special. Out of all the Cecilio models we have featured, the CVN-600 is the one most suited to soloists, due to the vibrant and dynamic sounds it can produce, that a large room will not be able to drown out. 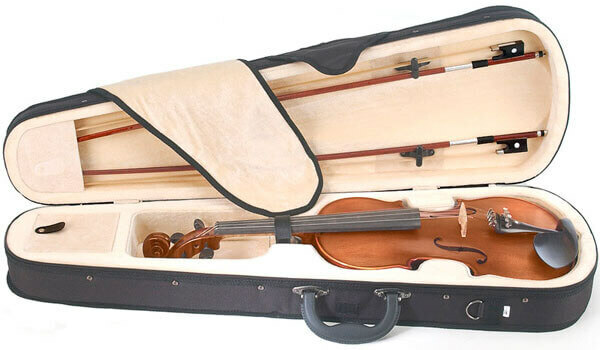 It is not a violin you would choose for beginners, but it will easily see experienced students advance through the higher violin grades and it would not look out of place in a concert hall. If you are a fan of Cecilio, but are looking for a good electric violin, don’t worry. This bold electric violin holds all the quality that you will know and love about these instrument makers, just with the added bang of electricity. This electric violin creates some of the best sounds that you will get from a violin at this mid range price. The mother of pearl inlay adds a special touch to the already impressive maple body and ebony fittings and the bow is equally as impressive. This violin may be out of the price range for beginners, so is more suited to those who are wanting an upgrade after learning the basics. The set comes with a lightweight case, headphones, cables, rosin and a 9v battery, providing everything you will need on your musical journey. Picture yourself on stage, rocking away to a classic rock tunes with this cool Cecilio in hand, pretty good hey? Whichever Cecilio you choose, you are sure to take home a quality violin that will provide hours of fun for you and your family. If you are a beginner, or are buying for a beginner, you cannot go far wrong with the lowest priced option and when you fall in love with this brand, you can upgrade through the newer models. The later, and more expensive, models would not be out of place in a professional orchestra and are very durable, making them a good instrument to invest in and pass down to a family of learners.